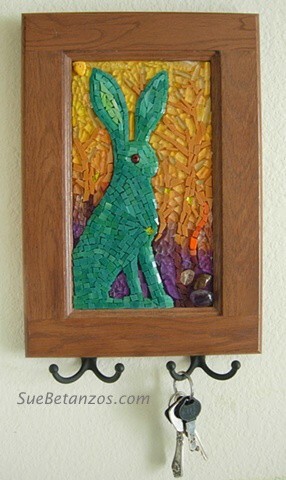 Tempered glass mosaic turquoise jackrabbit by Sue Betanzos. From my tempered glass series with real gem stones. Lupe the Jackrabbit is a mosaic in bas-relief, a slight raised effect. This is the ultimate holder for leashes, scarfs, keys etc. combining fine art and functionality. Order your own personal beautiful, functional piece! Application Ideas: home, spas, exercise studios, office, restaurants, kennels, training centers, stables, vet's office, anyplace where keys, leashes, scarfs need to be placed. Contact me for information on custom designs.